As of this afternoon, 3,300 2018 Dodge Challenger Demons are officially being shipped to dealerships. That means it’s only a matter of days before they’re delivered to customers, and that many casual motorists are cut loose on public roads with 808 horsepower. God help us. 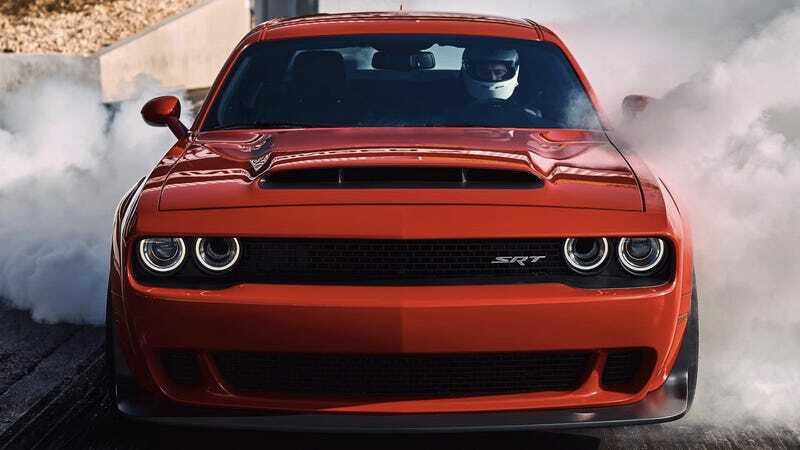 Don’t get me wrong, I’m excited that the Dodge Demon exists. The concept of a mass-market automaker building a street legal track weapon is righteous and I can personally promise you this one lives up to the hype on a drag strip. As for everyone else, I’m not sure if I should suggest you try and swing by a Dodge dealership to get a glimpse of one, or stay the hell away in case a Demon gets loose as it’s exiting the parking lot. Nah, I’m sure everyone buying a Demon will behav- hah, yeah. Nevermind. All I’ll say is, if you are taking delivery on one of these historic cars, you’ll be doing yourself a huge disservice by just matting the tall pedal the first chance you get. At least wait until you can get some high octane gas in it so you send its full 840 HP to a set of relatively fresh tires on a proper drag strip. Trust me, that experience will change your life.